At the end of November, the Israeli military’s Commando Brigade held a secretive war exercise, which sheds light on how Israel is preparing new capabilities against Hezbollah and Hamas. IDF special forces during a training exercise. Credit: IDF Spokesperson Unit. 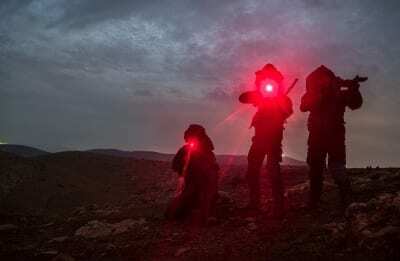 Just a short time before Israel launched an operation to expose and destroy Hezbollah cross-border tunnels, the three-year-old Commando Brigade held a 10-day war exercise, drilling combat against Hezbollah in Lebanon and against Hamas in Gaza. The brigade’s special forces units—Egoz, Maglan and Duvdevan—worked with the Israel Air Force practising airlifts and close air support, and moving quickly between combat arenas, and between open areas and urban-warfare settings. The exercise is the latest sign of a new ground-forces doctrine taking hold in the Israel Defense Forces. This doctrine will be highly influential on how Israel would take on Hezbollah in any future war. Earlier this year, the IDF divided up all of its ground forces into three new categories. One of those categories, dubbed Yeshuron (a biblical name reference to the people of Israel), is made up of the Commando Brigade and the Paratrooper Brigade. The IDF defines the role of this category forces in an important way. Yeshuron forces are “to deliver a strong punch to the enemy from multiple directions,” according to a senior officer who spoke at a media briefing earlier this year. That means they will travel ahead of, and often in isolation from, the rest of the infantry and armoured brigades during any ground offensive into enemy territory. They will be equipped with their own arsenal of high-tech weaponry and can be expected to receive missions to launch rapid raids against the most sensitive, strategic enemy targets. Special forces, then, would have a critical role to play in any Israeli future victory against Hezbollah. Hezbollah’s highly trained and war-experienced personnel, back from the Syrian battlefields, are experts in asymmetrical urban warfare, utilizing underground tunnels, working their way through civilian areas and have a host of deadly weapons to challenge their enemy. The special forces could be sent into to those areas that air power would find difficult to reach. Outgoing IDF Chief of Staff, Lt.-Gen. Gadi Eizenkot visited the forces at the end of November, speaking with commanders and soldiers about the changes experienced by the Command Brigade since it was founded in 2015. Changes are also underway regarding regular ground forces. These are receiving their own drones for aerial intelligence and new accurate firepower—capabilities that once only the air force had. These forces will also come with their own mobile defenses—an “Iron Dome” for ground forces—against rockets, shells and anti-tank missiles, which Hezbollah can be expected to rain down. Last summer, the IDF trained new types of regular-force brigades made up of combined infantry and armoured units to see how the new system works. Quietly, the IDF’s planners are developing a new Israeli ground capability that could dramatically improve Israel’s strategic situation, if the need to activate it arises.